Jaden has spent her entire high school carrer dedicated to her grades, volunteer work, and extracurriculars. She's been dreaming about getting into Harvard for years, and now she's just days away from finding out if she's been accepted. When she's paired with Parker Whalen for a project in AP English, Jaden is slightly perturbed. Parker may be new to school, but he has a reputation for being a slacker and Jaden doesn't want to lose focus. But she's about to find that there is a lot more to Parker--and to life--than she initially thought. Cross My Heart is a fun read with a sweet romance and realistic dialogue. The initial drama in the novel unfolds very nicely--Jaden doesn't see what she's missing out on, she doesn't really like her boyfriend that much, and there are some tensions in her family life with a distant father and a very full house. When she begins to get to know Parker, all of these issues begin to come to a head, and Jaden leans on him more and more until they find that they're falling for each other, much to the dismay of everyone around them. Parker's reputation results in the mystery of his past--no one seems to know much about him at all until Jaden takes the time to become his friend. The premise does seem a bit hokey, but Klein's voice is fresh and she includes many references to Edith Wharton's Ethan Frome, which is a book less widely read than the classic that usually are slipped into YA novels and fits into Jaden and Parker's story nicely. All of the elements work together well until the end of the novel when Parker's big secret is revealed. It's one that requires a stretch of the imagination to accept, is rushed out onto Jaden and the reader, and is portrayed a touch too unrealistically. Jaden's reaction to his news and how she deals with it are also very awkward. This is a disappointment since it's very easy to see how, with a little more careful editing, Klein could have made it believable. Still, readers will be rooting for Jaden and Parker, and a happy ending does follow. Cross My Heart is a wonderful romance, and if readers can get over the unbelievable (but romantic) ending, it's worth the $3.99 spent. Cover Comments: The cover doesn't have anything to do with the book, but it is pretty! It doesn't look like it has been independently published, which definitely helps it! 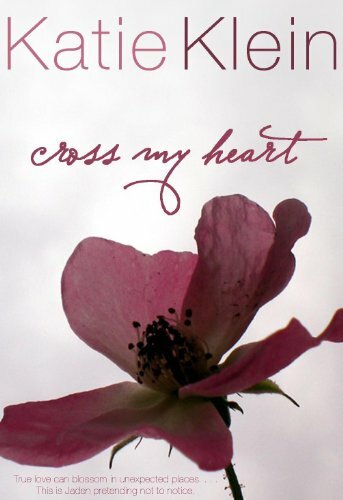 Cross My Heart is available for $3.99 as an e-book! Review opy purchased from Amazon. I so agree with you! At the end I was just like "WHAT?!". I feel like if she had stuck with what he was telling her, it would have been more believable. But it was still a fun read and I really loved Parker! It was sounding so good but now I'm not sure as I hate when you invest so much of your time and your soul into reading a book and then it ultimately disappoints you. Not sure now if I want to read this but the cover and the price are attractive. I KNOW. I feel like it really could have worked if she had incorporated clues/evidence to support Parker's job into the entire novel. The interview with her at the end of the book said that she wrote and wrote until she got to the end and THEN she decided that Parker would be undercover, and you can tell. If she had gone back and included more clues (like Jaden's bf acting secretive or on drugs) it would have been more believable to me. I don't know about the plausibility of an undercover cop that young, but she could have sold it to me if the writing had been tighter. Also, the writing was GOOD until the drug bust scene. I went back and read it three times after I initially read it, and the time sequence, actions, and positions of the characters don't really add up. It's really weird, and that just makes the entire thing seem forced. Okay, end spoiler. Feel free to post spoiler-y comments and add to the discussion, but please post a warning for the sake of others who haven't read the book. I agree with you, Tirzah...it just didn't fit and it made everything throughout the rest of the book feel less validated. I mean, if I was giving someone my lunch because I thought he couldn't afford to eat then I found out he could, I would FREAK. Also, I feel like there would be rules prohibiting an undercover cop from fraternizing with students, ya know? I know what you mean! Like, if Parker were a cop, he would NOT be sneaking into Jaden's house in the middle of the night! The whole thing makes me want to call up my cousin (who is a police officer) and talk to her about the plausibility of the plot. On one hand, it's like, "Oh, whatever, it doesn't matter. It's just a story." But...when the writing started to get awkward....uhhh...no. I really, really wanna make a bunch of notes and suggestions and give them to Klein because I feel like this book is good, but it could be GREAT. Agreed! I felt that way with Beautiful Disaster (see my review) as well...It's like these books could be so, SO wonderful but when you get to the final quarter it's like WTH?! I can definitely stretch my imagination with fiction but when it's contemporary, it has to make sense and be realistic. It was such a let down, compared to the rest of the book. Harmony, I agree! So frustrating. Buying these independently published e-books is always a little bit of a gamble. I always buy well-reviewed ones, but still, you never know. I'd still recommend this one, but I'd warn people about the ending. It does sound rather cute, but I dunno if I would like it!